Keeping residents safe was a top priority when Hamilton County, Indiana made plans to expand the local Monon Greenway rail trail. The city of Indianapolis calls the Monon Greenway one of the busiest urban greenways in the nation, and providing this bridge crossing over 146th Street was key to the success of the trail’s northward expansion. Searching for a solution that could meet the site’s requirements, designers turned to Redi-Rock. 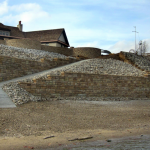 To create the reinforced retaining walls required for the project, designers chose the Redi-Rock Positive Connection (PC) System from local manufacturer Redi-Rock of Kentuckiana. The Limestone texture Redi-Rock PC blocks have the look of natural stone, but are engineered to work with modern bridge design. With the PC System, there’s virtually no chance of a pullout connection failure because the grid wraps through the block. The resulting connection does not have a weight dependent (friction) component, so it provides as much strength at the top of the wall as at the bottom. In addition, there are no extra parts and pieces or mechanical fasteners required for the connection-simplifying the construction sequence and eliminating common installation errors. The vertical batter helped minimize the space required for the retaining walls. “It was a very challenging place to work in. We were spanning a busy street, so we had the challenge of working in a very tight space and trying to do it in as short of a space as possible and trying to do it with as little disturbance as possible,” Knight said. The design of the bridge structure needed to be completed in a very tight footprint to maintain the required trail widths and right of way. “As far as the design is concerned, the load from the bridge was on piers and the wall needed to fit around the piers within the dimensions the city allowed,” explained wall designer Curtis Derichs, PE and Vice President of Civil Design Professionals. The vertical wall face was able to meet the AASHTO LRFD design standards, which was important for this project because federal and state DOT funds were involved. The PC System provides superior connection strength, which allowed Redi-Rock to easily meet this design standard. The vertical batter helped the walls coordinate with the bridge piers. “With so many inside and outside corners it becomes more and more difficult for everything to fit as the wall gets taller. As a result the walls were designed with near vertical batter to help ease of construction,” Derichs said. In total, the project required 11,000 square feet (1,022 square meters) of Redi-Rock PC System retaining walls leading up to and away from the bridge. The bridge structure itself spans 428 feet (130.5 meters) with a 12-foot-wide (3.7 meters) path to provide safe crossing for users. The main span consists of a single, 108 foot (32.9) span utilizing a steel bowstring arch truss. The four approach spans are made up of steel pratt trusses 80 feet (24.4 meters) in length. Reinforced Retaining Wall Blocks – Build MSE retaining walls with the revolutionary Redi-Rock the Positive Connection (PC) System. Limestone Texture Blocks – Redi-Rock Limestone blocks mimic the texture of natural split Limestone.